We’ve all heard of ‘steet evangelism’, but have you heard of ‘street collectionism’? Since passing the plate around every Sunday morning, Sunday night, and Wednesday night isn’t enough; the queen bee sends out the drones on the busiest intersections to ask for donations. Equipped with buckets and posters explaining their worthy causes, this hive of busy bees risk life and limb darting in between lanes and knocking on car windows. Of course everyone is buzzing around with blazing smiles wearing some christian culture couture (ya know the cliche t-shirts with crosses, thorns, and nails embedded with bible verses). As i drove past this group of Christians on the corner of Atlantic Blvd and Hodges Blvd in Jacksonville, FL, it took a great amount of effort to not yell out the window at them . . . well, also the fact that i don’t have power windows. I’ve never seen this group on this corner handing out water, or even evangelizing. If you are not seeing the problem with street collectionism, i think you need to reread what the gospel is about, what the church is here for, and what are our responsibilities. The fiscal responsibilities of the Church is not a public matter. If the Holy Spirit is not moving within the hearts of the Church to fund your little pet project or or christian class trip, then there should be shame in the lack of financial, spiritual, and theocratic support advertised to the public. If God has failed to provide for his own ministry through his own institution; then you’ve gotta ask some serious questions about the existence of that ministry . . . either that or the incompetence of God. 1 Timothy 5:8 states, “But if anyone does not provide for his own, and especially for those of his household, he has denied the faith and is worse than an unbeliever.” If we cannot provide for God’s house within the house of God, then i would even seriously question my faith. That is if God is who he says he is? Is he not the owner of a cattle on a thousand hills? I hope you can see that street collectionism is a severe dilemma; and not about some silly teenagers hanging out on the street trying to collect some pocket change for their innocent little trip. If we are serious about God and our mission, than we’ve gotta get serious about our representation of Christ. Standing on the street corner, begging for donations is not cute. It’s not funny, and it is theocratic mockery. As a child, if my father saw me on the street corner begging to strangers for bread, i am sure it would have embarrassed him. How much more would our heavenly father be displeased to know that we’ve outsourced our financial responsibilities on the public? Since our actions speak louder than our words, I believe street collectionism answers questions about the sincerity of our faith better than our christian couture does. Anyone can wear Jesus, but not everyone can be Jesus. I am challenged just as much as anyone with this statement also. It’s been quite some time since i’ve distributed cold water in the name of Jesus, and only for the sake of Jesus without an alternate agenda. Jesus doesn’t need solicitors; he needs disciples who will make disciples, who will make other disciples. Leave the soliciting to the Red Cross and the Girl Scouts. 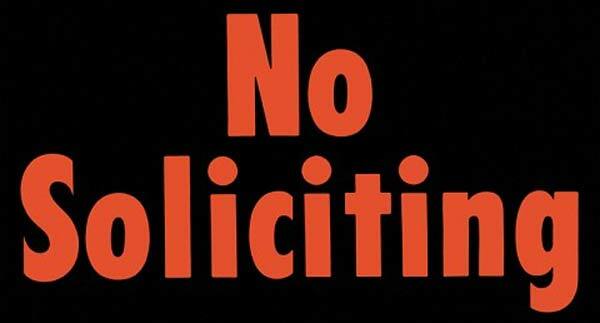 Do you think it's okay for churches to solicite donations on the street? There are times when it is just okay to have someone solicit donations from you on the street as long as these are from legitimate organizations. With the many people who are getting into deceiving other people on the streets its hard to tell which is which. I would prefer to give my donations in church to be sure that they go to the right people. I voted yes. I base this on the same line of thinking as Marcus. However, since I am an inquirer within the Secular Franciscan Order, I have some unique historical references of one of the most imaginative saints in history as St. Francis of Assisi. This trabadour of the Lord went about begging, but keeping nothing for himself and putting such things to good use to bring about social justice within his own time and culture. So for a few points of consideration, 1) for American idealism regarding the God given rights of expression, I could argue that to become a dictator and denying these “Evangelical Collectors” just is not American excepting in talking a big bark of decent as an opposing viewpoint. However, I don’t believe in such individualism when it comes to Church matters because I am not a “Cafeteria” Catholic making Catholicism meaningless by creating a personal schism. 2) When it comes to big projects, small parishes cannot be able to tax its congregation to met the damand. If the cause is worthy enough, of which I think many Catholic charities with its creation of hospitals and universities throughout the world and also the creation of job skills by teaching skill crafts and promoting the arts (who does not like the beauty of the Book of Kells, or of the art of the Sistine Chapel, or of the icons of the Eastern Catholic/Orthodox). I, myself, am starting to propose to my fraternity a sort of Catholic Charities vending platform to take to the Rennaisance festivals and other types of fairs. What I hope to do is not “sell” something to fit the third option in the poll question regarding “do you think it’s okay for churches to solicite donation on the street?” What I propose to do is take away the craftsmanship of the New Age vendors by offering free knotted rosaries, Orthodox prayer ropes, and perhaps use calligraphy to create artistic frames for the home. Spark creativity, get away from the TV and put your hands to work, start a hobby that brings authetic pleasure and perhaps you create a living away from the mundane factory labor. 2) How did Jesus give money to the poor? Perhaps he didn’t pass around a collection plate at the feeding of the five thousand, but Judas clearly was the treasurer. Perhaps they sold fish, but it seems Peter left that behind to follow Christ and become a fisher of men. It does seem there was a pooling of sorts in Acts with accepting the assets of the individual members of the community that goes well above any sort of conception of a tithe to where Annanias and his wife lied to God, lied to the Holy Spirit, and it didn’t go well with them. Even Peter stated in Acts something to the effect of silver and gold have I none, but rise up and walk. So perhaps there is some aspect of the Fathers of the Church, of monasticism, of St. Francis talking about Lady Poverty, of such simplicity. If you want to convince me that Christ was as rich as a televangelist preacher, I don’t think I could wash that down with a gallon of milk.